Mammograms are images of breast tissue captured using ionizing radiation. At QHC routine mammograms are performed at Belleville General Hospital and Trenton Memorial Hospital three (3) days a week and at Prince Edward County Memorial Hospital once a week. QHC currently has three (3) Giotto Digital Mammography units and two (2) dedicated Radiologist work stations for reporting mammography images. 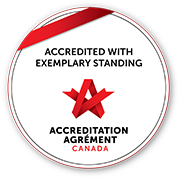 The mammography program at QHC adheres to the standards set out by the Canadian Association of Radiologists Mammography Accreditation Program (CAR MAP). If you are experiencing any breast symptoms consult with your physician to arrange for non routine/non OBSP diagnostic imaging of the breast. To book your routine/OBSP screening mammogram appointment, call the Diagnostic Booking office at 613 969 7400 ext. 2494 between 0800 and 1600 hrs. Please have your health card ready. A series of questions will be asked which will assist us in ensuring the correct appointment is booked and that all relevant mammogram images are available to the radiologist when they report your exam. Belleville General Hospital: Please arrive at the Diagnostic Imaging department main office 15 minutes prior to your appointment time. Trenton Memorial: Please arrive at the Diagnostic Imaging Main Office 15 minutes prior to your appointment time. Bring your health card and requisition with you. Appointments scheduled through the OBSP program do not require a requisition. Prince Edward County Memorial: Please arrive at the Patient Registration desk 15 minutes prior to your appointment time. Bring your health card and requisition with you. Appointments scheduled through the OBSP program do not require a requisition. You should wear a comfortable two piece outfit and avoid wearing any deodorants or powders. Please click on any of the following links to find out more about your exam. Your mammogram images will be reported by a Radiologist and an official report will be sent to the ordering physician. In some cases, follow up imaging of the breast may be requested by the Radiologist. If this is necessary, then staff from the Comprehensive Breast Assessment center at Trenton Memorial Hospital will call you to arrange an appointment.